Supporters of separatist People's Political Party (PPP) leader Hilal Ahmad War, hold banners and shout slogans during a protest in Srinagar, Indian-controlled Kashmir, May 19, 2018. Indian Prime Minister Narendra Modi speaks during a function to inaugurate the Kishanganga hydropower station in Srinagar, Indian-controlled Kashmir, May 19, 2018. Modi arrived in the remote mountainous Ladakh region bordering China and Pakistan, where he inaugurated work on a strategic 14-kilometer (9-mile) -long tunnel connecting the cold desert region with the Kashmir Valley. 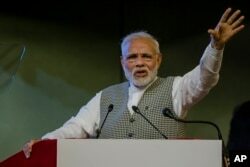 Later in Srinagar, Modi inaugurated remotely a controversial hydroelectric power project built in the Gurez Valley, just a few hundred meters from the highly militarized Line of Control that divides Kashmir between India and Pakistan. He dedicated the power station to the nation at a lakeside venue. 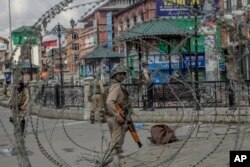 Indian Paramilitary soldiers are seen through barbed wire in Srinagar, Indian-controlled Kashmir, May 19, 2018. Pakistan has objected to the design of the power project, invoking the Indus Water Treaty. The neighboring countries signed the treaty in 1960, brokered by the World Bank, to share the vast water resources from the Indus River system, which supplies water to both. Meanwhile, dozens of Kashmiris tried to march to the main commercial center in Srinagar after defying security restrictions imposed on the assembly of more than four people in the city. Scores were also detained after shouting slogans demanding end of an Indian rule over Kashmir.